Yet again, I’ve been stuck with leftover steak, people! I know many of you never have that problem; “What leftover steak?” you’d say! And others might not have an issue with a little extra steak in the fridge! But leftover steak has always stumped me just a bit – it seems to sit there and say “I’ll never be as good as the first night.” Well, that’s what I thought until recently, anyway. They say that familiarity breeds contempt, but helping out my favorite octogenarians, the folks, who love steak more than their teeth do, has gotten me pretty familiar with leftover steak. There often seems to be some tucked away in the fridge. And so I’ve started getting more creative with the leftovers. Tacos, this time folks! Tacos! It’s amazing how far a little bit of steak went tucked inside soft tacos. And amazing how good they were with very little effort. (I used home-made fajita seasoning to spice things up – but taco seasoning would be awesome, too.) Best of all, thinly sliced against the grain (which is much easier to do with cold steak) the steak was tender and easy to eat. I might make just a little extra steak next time, just to have this later in the week! What a great no-effort way to get a quick dinner on the table on a hot, summer night. Tonight I kept it simple and served with black beans, avocado and basic taco add ins like my Pico de Gallo, but quickly cooked bell peppers and onions would be great with these tacos, too. When shopping for steak, watch the specials – the grocery will often have specials to lure you in the door, especially before almost any holiday. Avocados are frequently on sale, too, but frankly, tacos go with so many things that you can let the price guide you on the sides and accompaniments. Remove steak from refrigerator, slice thinly across the grain. Set aside at room temperature. Heat heavy skillet over medium high heat. Add a tortilla and heat through until there are a few darkened areas, about 30 seconds. Turn and briefly heat other side. Place in a clean towel and cover. Repeat until all tortillas are heated through. Add oil to saucepan, heat over low heat. Add seasoning and allow to warm through, stirring. Add about 1/4 cup of water, bring to a boil and allow to reduce briefly until there is just a little liquid remaining. Remove from heat. Quickly toss the steak in the warm liquid. Serve in tacos with lime. Notes: Letting the steak just barely warm through as you toss it in the spice mixture is absolutely key to keeping it tender and juicy. The lime is essential, also, as it perks it up and gives such a fresh flavor. Today, of course, I’ll be linking to our very own Throwback Thursday Link Party, hosted by Quinn of Dad What’s for Dinner, Meaghan of 4 Sons are Us, Alli of Tornadough, Carlee from Cooking with Carlee and Moi! That’s right – me! And, as I do almost every Friday, I’ll be linking up to Angie’s Fiesta Friday – this is Number 132! Many of my fave bloggers hang out there every weekend and this week’s co-hosts are Sandhya @ Indfused and Nancy @ Feasting With Friends! It’s always a fun line up of bloggers and linkers. The weekend wouldn’t be complete if I didn’t link up to Saucy Saturdays! Four bloggers, 4x the fun! I was surprised to see they gave me a HUGE shout-out this week! Thanks, guys! This entry was posted in Click here for Bargain Meals, Click here for Fabulous Food Posts and tagged Bargain Meal of the Week, Beef, Fajitas & Fajita Seasoning, Frugal Hausfrau, leftover beef, leftover steak, Leftovers, Lime, Mexican or Southwestern, steak tacos, Tacos. Bookmark the permalink. Lol!! At my house, it would be my son! The bottomless pit. He still walks right in and goes straight to the fridge! 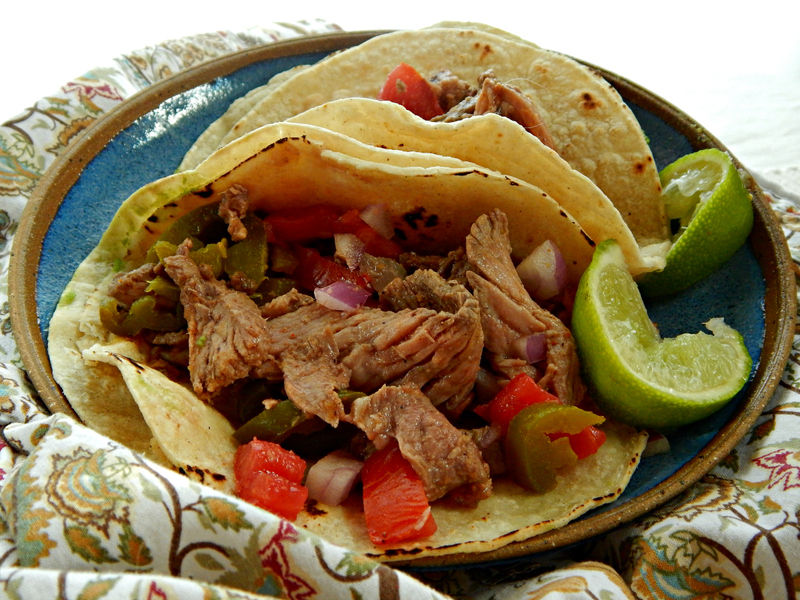 I am always happy to use leftovers in a new way and these tacos sound delish! thank you so much for sharing them with us at Fiesta Friday! lol, Debbie! I could probably eat one of these every single day and not get tired of them! We came back from France by ferry last night. I had their tacos in the grill restaurant. They were everything a taco should not be. You show me how it could be Frau. Thanks for restoring my taco faith. lol, Conor, and thank you! 🙂 I’m not sure how anyone could f/u a taco, but in the future probably best to stick to something rather benign on the ferry. A ham sandwich, perhaps…saltines? Very good recipe, looks delicious and appetizing !!! Thanks much! The steak, barely heated, was delish. We make tacos and burritos, and even a quick stir fry all the time with our leftover steak, which seems to happen often as our daughter always last-minute has other plans for dinner. I’m glad you found a good use for it Mollie! 🙂 Being “frugal” leftover steak was never a problem at my house – especially with my son around! Stir fry sounds fun, too!